Gooseberries have a short season in the UK from June until August but you can enjoy them for longer by pickling them in vinegar and sugar. Green gooseberries are most suited to pickling due to their firm, tart flesh so keep the red ones for jams and desserts. You can add many different spices to add flavour to pickled gooseberries; ginger, cinnamon, cloves, mustard seeds and peppercorns all work really well. You could also add lemon zest for extra sharpness or chilli if you like a little heat. 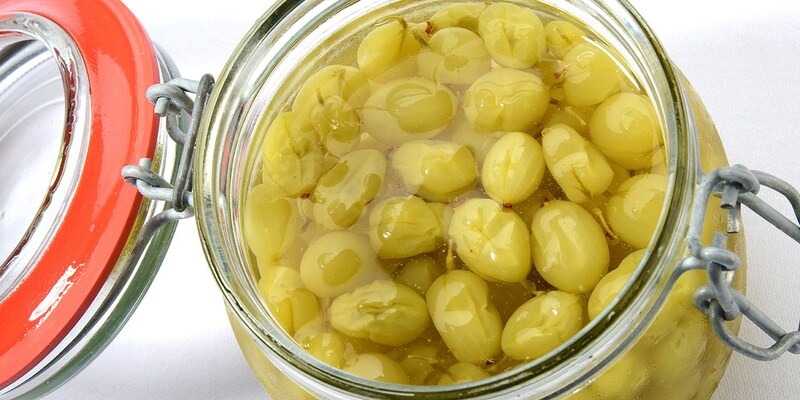 The most traditional serving of pickled gooseberries is with mackerel but pickled gooseberries would also be a fantastic accompaniment to a cheeseboard, the acidity cutting through rich cheeses such as a strong cheddar or soft, lemony goat’s cheese. Gooseberries also pair well with rich meats such as pork and game birds.